As healing as any piece of theater can be: Third Rail Repertory Theatre's "Recent Tragic Events," through March 12 at CoHo Theater in Northwest Portland. It may be safe to say that when a school kid can tell a joke about a tragic event that involves its most intimate victims, it's a fair if not infallible indication that the healing in the national psyche over that event is in its last cycle. The kid tells the joke, unaware that the ramifications of the tragedy continue on into his culture, affecting him directly or indirectly as each successive generation forgets a little more about why. However, healing times vary and jokes may not always be so much of an indicator as they are a defense mechanism against the pain. Almost 20 years ago, jokes about the Challenger space shuttle explosion came almost immediately after it happened while people were still numb with shock. As a result, every school kid of a certain age knew Christa McAuliffe's last words: "What does this little button do?" In Third Rail Repertory Theatre's superb new production of "Recent Tragic Events," writer Craig Wright ("Six Feet Under") asks, "What would a flip of this coin do?" When a tragedy is as epic as 9/11, a response from the arts and entertainment community that goes beyond the initial gallows humor is required. It can be a long time in coming, and it's really hard to make it successful on an artistic level for a lot of reasons. For one thing, no one wants to be accused of trying to make money off of it, and if it's not perfect, it's judged harshly. On the day of 9/11, anything any artist was working on felt as if it became instantly meaningless. Some continued writing anyway, in hopes of ending up with something that approached truth. Last year, Portland Center Stage tried valiantly with an excellent production of one of these plays, "Another Fine Mess," which inadvertently became the poster child for this problem. It seemed like there were two entirely different plays bound up in one  and one was a really clever comedy full of world theater references and light banter about petty differences between egocentric actors backstage before a performance. My guess is that it was written just before 9/11, then, after that day, was considered pointless. That is, until the writer salvaged it by lashing it onto an inconclusive Act II, a landscape of sudden, massive destruction where suddenly every line was globally symbolic and the characters lost their individual personalities to become victims of all war and violence throughout the ages. It's as if the playwright was floating in a sea of inarticulate shock and pain and could only barely manage to get us all out of the pit with a vague image of peace and love in the figure of a boy and a boombox with a really pretty song at the end. But in the immediate aftermath of 9/11, it was all an audience had available that wasn't soaked in the literalism and horror of Ground Zero. So it's been as hard to watch attempts by writers to make sense of 9/11 as it has been for them to write about it. But now it's time for something completely different, which is why I wholeheartedly and unreservedly recommend this current production of "Recent Tragic Events," the first of what I hope are many more productions to come from Third Rail. Now that it's been three and a half years since the events of 9/11, and even though there is nothing funny about it for anyone living in the aftermath, the tragedy may possibly now be served well by comedy, especially if it is comedy that takes us away from Ground Zero to a safer place  like an apartment in the Midwest where a blind date is struggling to get off the ground even as fresh news about the WTC tragedy is blaring from the TV. 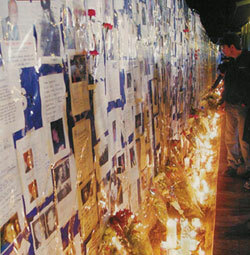 Elements of universal suffering: a heartbreaking but engaging face on the tragedy of 9/11. Even though we are safely halfway across the country in this story, we're instantly reminded of how close we all felt to New Yorkers that day. But we are put into the middle of a situation that we quickly grow to care about and, incredibly, Wright makes us laugh out loud in the course of things. In the bargain, he slyly guarantees that we will never look at Joyce Carol Oates in the same way again. It's not that it's "time to move on" so much as it's time to switch tactics in dealing with 9/11 and all the political fallout that has come with it. It's as if we've all been gorging on raw footage, testimonials, eulogies and Bruce Springsteen songs, and now we need something to help us back away and digest. Michael Moore stepped up with "Fahrenheit 9/11," pointing an antic finger on the big screen at the ones in charge who screwed up. More intimately, HBO's series, "Rescue Me," starring comedian Dennis Leary, features the ghost of a firefighter who died in the WTC collapse and is still deeply (and sometimes absurdly) invested in the lives of his family and friends. "Rescue Me" is a funny, dark show and, while not exactly uplifting, it is fulfilling a very serious purpose as we all try to find emotional recovery. But even more intimately affecting than a TV show is the phenomenon of live actors performing extraordinarily well in a small theater space with nothing between them and their audience. In one character's case, not even underwear gets in the way. The playwright starts "Recent Tragic Events" by having a member of the audience flip a coin to determine the direction that the play will take. Each time a character makes a decision which depended on the coin flip, a "tone" sounds to let us know. This device is used to hilarious effect throughout Act I. As we all know, performances do vary. The performance I saw early in the run was laugh-out-loud funny. Weeks later, the play still haunts. The ensemble was tight, the work was specific, the ideas were provocative and, at the end of the play, I was moved to tears. I enjoyed every single cast member's performance. 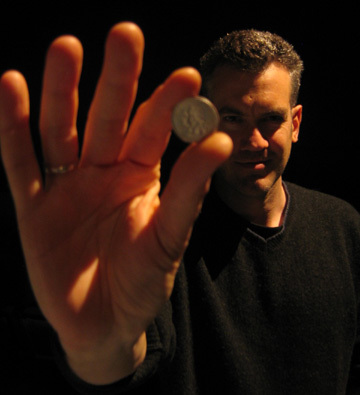 Even Jack A. LeMieux, the stage manager with the coin, is endearingly self-effacing. Valerie Stevens as Nancy, the soul of simplicity, is dignified and funny without saying a single word  until Act II, when she finally has a hilarious and expressive hand in how events play out. The comic panic of Stephanie Gaslin (playing Waverly, a woman valiantly trying to hold it together on her blind date as she waits for the phone to ring with news of her twin in New York City) keeps the reality of surrounding events alive and puts a heartbreaking but engaging face on the tragedy of WTC. In counterpoint to Gaslin's emotionality, Tim True is the superb emotional enigma of the play as Andrew, her date. He's a guy so tightly wound that he makes each act of decision making seem physically painful, simultaneously full of dread and hope. 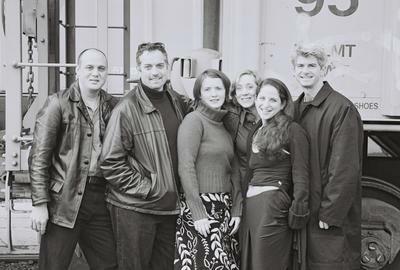 Portland's Third Rail Repertory Theatre (from left): Tim True, Slayden Scott, Stephanie Gaslin, Valerie Stevens, Rachel Brodkey, and Michael O'Connell. The subtle interactions between True and Gaslin are like watching a complicated but fascinating mating dance between long-legged birds who would much rather take flight than fight. They adeptly capture the ineffable point the playwright makes about the inevitability and helplessness of human entanglements. This in turn beautifully mirrors the larger issue of a nation helplessly watching a catastrophe that was always just waiting to happen. Andrew's decision at the end, whether or not to get involved when confronted with Waverly's pain, is both affirming and disturbing at the same time. True handles it subtly and beautifully. The sensitivity with which director Slayden Scott handles all the actors in the moments leading up to that instant is powerfully on the mark as we watch them struggle against all the outside forces shoving them together  or in the case of Michael O'Connell's character, Waverly's perpetually stoned neighbor Ron, apart. Especially masterful is a wordless 10-minute card-game sequence at the top of Act II that serves up themes of forced choices, fate and affectionately honoring the dead even as it hilariously entertains. Because the ensemble is so tight that each character could probably take turns dominating the play on any given night, the particular performance I saw belonged, if one must choose, to Michael O'Connell. His Ron is a wise fool in the best Shakespearean sense as he cosmically ladles out the deeper questions and truths of the play: What are we doing here? Do we have any real say in the matter? And how do we go about dealing with the answers? I'd thought I'd seen enough freeloading neighbors wandering in and out of the action of various comedies, but O'Connell transcends the difficulties of the script and injects the character with incredible humanity, humor, empathy and insight. There are lines in "Recent Tragic Events" that are not innately funny  but OConnell makes them so, while infusing the script with more timing, fluidity and grace than is actually there. His characterization is so complete that I did not recognize him (until I read his bio) as the impassioned, articulate art aficionado that he had played so deftly opposite Tim True and Alan Nause in Artists Rep's "ART" a couple of seasons ago, or even as one of the performers in "Another Fine Mess," the problematic but nevertheless worthy post-9/11 effort mentioned earlier. Both plays do have elements of universal suffering that I strongly believe will mean more in years to come than they do now to today's still shell-shocked audience, as the deeper themes of helplessness in the face of violence and the capacity of the individual's heart to adequately comfort, inevitability sink in. All told, I appreciate the difficult task all 9/11 writers have set for themselves to tackle this particularly sensitive subject. Before their efforts are dismissed as "failures," which a lot of critics will inevitably do, I would like to point out that, for this generation anyway, the reaction to the material is going to be highly subjective and colored by one's own story of that day  much like that play of another generation, "Kennedy's Children." That play has not held up particularly well over time, but it did serve a peculiarly healing purpose for its own time. This alone would be a good reason to see "Recent Tragic Events." The use of actual TV reports in the sound design is emotionally hard to hear. But the play highlights the fact that there are these raw bits of grief parts still hanging off the edges of the national psyche, which is something that should be brought to light again and again until, like the Kennedy assassination, scars can replace the open wound. "Recent Tragic Events" is not a perfect play, but it's a very good play that is smart, very funny and admirably realized. It is ultimately as healing as any piece of theater can be at this particular point in our history. Third Rail: off to a great start. It doesn't shy away from the big questions, either. Questions like: Are we really as in charge as we think we are? And: We always should do the right thing  but when are we forced to? And, with a puppet as one of the main characters, it comically begs the other question: Are we just pompously spouting concepts with which we've been brainwashed while pretending not to notice the massive hand up our butts controlling our every reaction? Third Rail is off to a great start, and they are to be commended for choosing such socially relevant material as an inaugural piece. Find more from Joan-Carrol in our archives.